solution of traffic jam Archives - Khaled Rent A Car in Dhaka, Bangladesh. Your Secured and Trusted car rental partner. 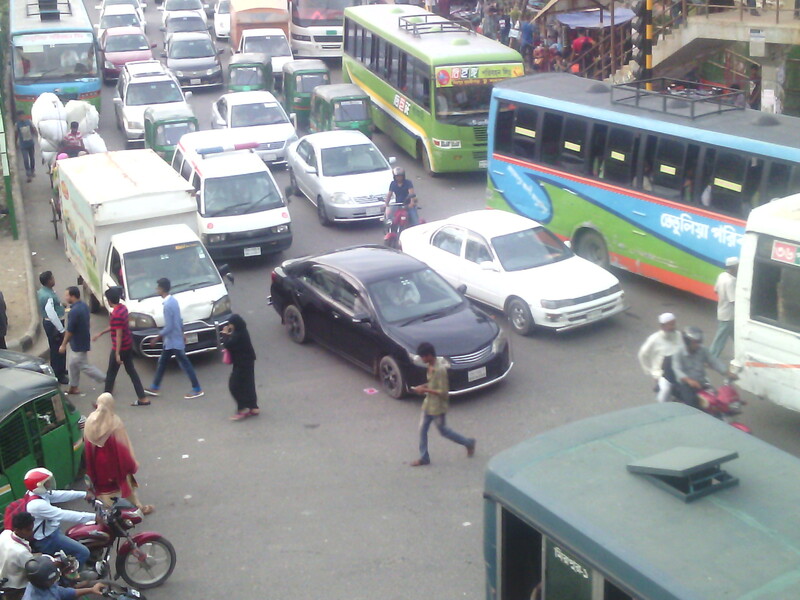 SOME improvements in the traffic movement of Dhaka city have been noticeable following the change of government last year. The communication ministry under its present leadership has been showing some appreciable interest in improving traffic movement in the city. This was reflected in more attention paid by traffic policemen at ground level to keep the traffic flowing smoothly. But whatever good things were achieved in the sphere of traffic movement in the city seem about to be lost as the indifference and lack of seriousness in relation to their duties are once again creeping back among the traffic policemen. In the last couple of days, the city experienced heavy traffic jams at many points. The rains and dilapidated sections of roads contributed to these jams as some would contend. But to the careful observer, it was apparent that more than any other factor, the attitude of traffic policemen and their lack of devotion to their jobs were the most important reasons for the reappearance of the jams in much the same fashion as in the past. Traffic must not be held up for too long at busy intersections. But the traffic policemen are seen holding up traffic at many intersections for an inordinate length of the time with the result that long queues of vehicle build up in the rear as a consequence. When the signal is at last given for these vehicles have passed through, the signal is given again for the vehicles to stop. Such improper signaling, thus, leads frequently to jams of the sort that have been seen in recent days. Besides, the traffic policemen are hardly seen doing their duties in relation to improper parking of vehicles in busy roads and areas. Buses do not stop at designated bus stops but in the middle of the roads from where passengers embark and disembark. Traffic policemen turn a blind eye to such practices. The buses thus block the way for the other vehicles and jams build up. In many places of the city’s roads, traffic policemen are seen stopping buses, trucks and other vehicles to examine their papers. The real motive is bribe and as the traffic policemen allegedly remain busy in collecting bribes, they find no time to do their real job with care and this is not a small factor often for the creation of traffic jams. Senior police officials hive to keep watch and play due role in this regard for ensuring smooth flow of traffic. It is important that the relevant ministry should take hard look afresh at the poor quality of traffic management in the city with a view to improving the same. The citizen of a town travels office-court, business institutions and school –collage every day. Sometimes goes for shopping, relatives and friends houses, social activities, seminar and symposium and hospital and clinic. If the citizen use private car instead of public transportation for daily travels, then the traffic jam must be happened. Because, the occupied space by the two passengers of two private cars is more than the occupied space of a 50 passenger’s bus. Many low income or middle income family also use 2nd hand or 3rd hand private car of 3 or 4 thousand Taka for their travel because lack of speedy and dependable transportation. But the private car should be used for seldom moving. There is a plan to implement the Metrorail or underground rail in Dhaka city, which will take long time. It is possible to make speedy the public bus-cab within a few period of time. It is needed to unity the all bus-cab in a public limited company. The investment will be by the share not by the ownership of the bus. The step would be as like as all the buses of the present days will not be existed at road in a distinguish day like June 2017. Those will use for several routes outside of Dhaka city. The bus ownership share will be given to the present bus owner as a damage cost. It is impossible to start the speedy vehicle by keeping the present public transportation. All the three thousands new buses will start their journey at the same day. If we want to run the project successfully, it will have to need international conditioned good quality buses. Lower cost buses will be failed the full project. 100% AC bus will be required. It will increase the beautifulness if it will use the same colored and same model buses. But the bus number will be different, which will be appeared in front and behind of the both sides of the buses. 25 seats will be as gallery and 20 seats of in front will be as parallel. Autism, pregnant, older and women will be got the priority to seat at in front seats of the buses. It will have to manage to stand 20 people. The diagram of the Dhaka city will have to kept behind all the seats. The roads development will be taken beside the development of the buses. The bus stoppage will be remarkable distinguish. There will have to separate lane. Every bus stoppage and passengers shade will be same design and construction materials. The map of Bus network diagram of Dhaka city will have at the behind wall of passenger shade. Bus stoppage number and bus number with it. The names are in Bengali and English. The man who comes from village or the man who is a foreigner can understand the whole network easily. The rent may be same within the distinguish area in Dhaka city. It may be 20 taka in Dhaka and 50 Taka within the greater Dhaka. Ticket selling system will not in the bus or at the bus stoppage. The pass of 1, 3, 6 months will have for different route which will be issued by the bank of the bus company. The photo and the expired date will be bigger so that the driver can see it easily. The tickets will be got from here and there as like as flexi load. Any amounts of ticket can be bought. These tickets will be justified with the digital machine at the bus gate. This bus will be one man bus; it means only the driver will have but not the helper. Recorded message will have for different route, which will give direction of the stoppage to the passengers. There will have two doors, the front door is for get in and the middle door for get down from the bus. Any passenger will give the notification for get down by pressing a button. It will stop to the tendency of the forcing of getting down from bus of the passenger’s. The auto Rickshaw which are driven by CNG should be withdrawn and same amount cheat cab should be implemented. The cabs will have to durable and these will be lasted 8/10 years. Sufficient cabs of more CC (1500 to 2000 CC) will have to running beside it. All signal light’s should be countdown, which will keep the road speedy. Some under pass may be better in some sections. The under pass’s width would be 4 meter, height 3 meter, escalator for going up and sufficient light should be kept. The zebra crossing will have to mark clearly. A popular song will be start at the time of green signal of the zebra crossing. Footpath must be kept from home/working place to bus stoppage. The information of traffic management will have to show at BRTA for the drivers who are going to take the new license or going to renew the license. Why the accident occurred, traffic signal and rules, the directions for stopping the busses will have to keep at the information. The license validity will be 100. Point will be cut for breaking the driver rules. License will be cancelled if the point comes down under 30 and they will be taken the license after passing the exam. The cars’ price in Bangladesh is multifold higher than any developing countries in Asia which is not helping the development of Bangladesh and for the decentralization of power. A reconditioned 1500 CC car will be better if it is 7/8 hundred thousand taka. But additional cost may be applied according to CC when going to get the number plate of Dhaka metro. That means the car price will be 22/23 hundred thousand taka at Dhaka city where 7/8 hundred thousand taka will be for the village city. As a result the driver of village town won’t be stay at Dhaka city with their family. 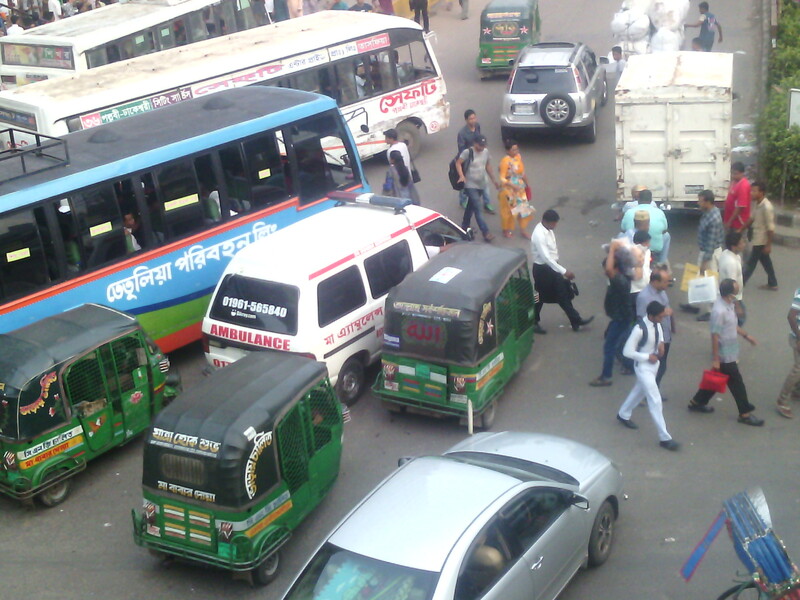 The village city cars will have given the high rate charge for everyday staying at the Dhaka city. Rickshaw will not run at the route of bus. After starting the speedy bus-cab, the even-odd number plate will be run at the even-odd dated as like as many countries in the world. Basically speedy bus-cab starting and the control of private car are useful which is seen at Singapore, Kuala Lumpur of Malaysia and Penang, Beijing of Chin or at Delhi of India. But the running bus owners of Dhaka should be come forward, and as like them the owner of private cars and government or non government officers should have mentality to use the public vehicle for sake of the country.